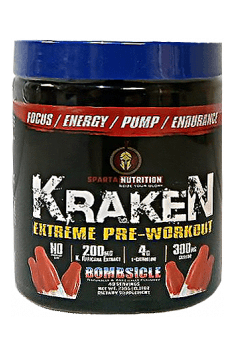 Sparta Nutrition Kraken is a pre-workout supplement with L-Citrulline, Beta-Alanine, HydroMax® Glycerol Powder, Taurine, N-Acetyl-L-Tyrosine, Vaso-6™, Theacrine, Caffeine Anhydrous, Theobromine, N-Methyl L-Tyramine Hydrochloride, Cocoabuterol® (Cocoa Extract Seed) and Vitamin B3 and B12. By boosting nitric oxide production and stimulating the nervous system, the formulation improves the body’s physical performance during exercise. L-Citrulline is involved in the urea cycle which leads to the removal of ammonia that causes mental and physical fatigue. Supplementing with this substance may therefore prevent fatigue and help you perform a workout without the urge to reduce exercise intensity. Increased muscle activity leads to the production of lactic acid which lowers the pH within the muscles and impairs the conduction of nerve impulses and muscle contractility. Beta-Alanine is converted into carnosine which reduces negative effects of lactic acid and that is why your muscles may work longer and more effectively. An increase in muscle endurance allows you to add more reps to each working set. A state of mind, which allows you to be fully focused and engaged in a particular task, increases your precision and overall efficiency in every field, including sport. Supplementing with taurine before and after a workout may enhance focus during a workout. N-Acetyl-L-Tyrosine from the supplement increases mental alertness and focus and improves training intensity by delaying the onset of mental and physical fatigue. An increase in nitric oxide (NO) blood levels causes the relaxation of vascular endothelium. This is very important for enhancing oxygen and nutrient supply to muscles and consequently improving training performance. The supplement contains L-citrulline, which is a substrate for nitric oxide synthesis, and Vaso-6™, a natural, patented ingredient that increases nitric oxide production and blood flow through the working muscles. HydroMax® is glycerol powder which contains up to 65% of glycerol. Adequate hydration levels of muscle cells aren’t only important for their size but also muscle fibre contractions. Glycerol increases blood volume and improves circulation in the working muscles. The most important benefit for bodybuilders is that the substance can bind water and cause its retention. It also enhances muscle pump. Your workout won’t have good results if you do not maintain your intensity or manage training loads. We don’t always feel up to doing a workout. After a hard day or sleepless night, we often lack energy to achieve all training goals. At such moments, we use substances or supplements which deliver a huge dose of energy and effectively stimulate the body. Caffeine anhydrous is characterised by better absorption than the simple form of this substance. Caffeine is a substance with stimulant properties whose mechanism of action is based on the antagonism of adenosine receptors. Supplemented before a planned workout, it helps reduce fatigue and increase training intensity and exercise tolerance. Theobromine, found in cocoa bean extract, has similar effects to caffeine, but they are milder and more lasting. The addition of theacrine to this supplement reduces the likelihood of overstimulation of the nervous system caused by caffeine and allows you to enjoy all benefits of taking this stimulant. N-Methyl-L-Thyramine Hydrochloride boosts the secretion of catecholamines such as adrenaline, noradrenaline and dopamine and may therefore contribute to increasing energy levels and activating beta-2 adrenergic receptors, thereby increasing cGMP and cAMP levels. Higher cAMP levels promote body fat reduction by increasing the basal metabolic rate (BMR) and oxidation of fatty acids which provide energy during exercise. Cocoabuterol® is a cocoa bean extract which is standardised to contain 50% cocoa alkaloids and is rich in polyphenols. The manufacturer of this formula enumarates many benefits of its intake, including body fat reduction, muscle growth, better muscle endurance and strength and antioxidant effects. Cocoabuterol® is also abundant in theobromine discussed above. Vitamin B3 and B12 are involved in energy metabolism and beneficially influence the nervous system and mental activity by improving the overall mental health and promoting well-being. To sum up, Sparta Nutrition Kraken is a dietary supplement which is recommended both to professional and amateur athletes who want to increase training effectiveness and maximise training benefits. The product is also recommended to individuals with a drop in energy levels and lack of motivation for doing regular workouts and pursuing training goals. Natural and artificial flavors, sorbitol, citric acid, silicon dioxide, acesulfame, silica.